We received some exciting news this week when ViewRanger was awarded the prestigious Editors’ Choice badge by Google Play. The Editors’ Choice certainly isn’t given away lightly, with only specially selected apps around the world having received it so far. 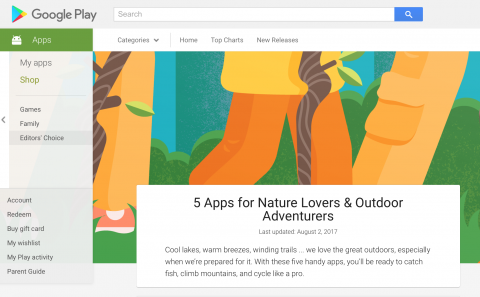 It’s carefully hand-picked by the Google Play editorial team, with chosen apps rewarded for introducing users to the best innovation, creativity and design on Android. And in addition to receiving a shiny blue Editors’ Choice badge on our app listing, ViewRanger will also be pride of place in the Editors’ Choice: 5 apps for nature lovers and outdoor adventurers section for the next few months. This award is recognition of the huge strides we’ve made as an app, team and company over the past year – firstly with the release of our pioneering Skyline augmented reality feature in November 2016, then the significant update we made to our Android Wear smartwatch app in April 2017, followed just this week by a major design refresh of the app. If you haven’t seen our new look yet, download the latest version and check it out now! 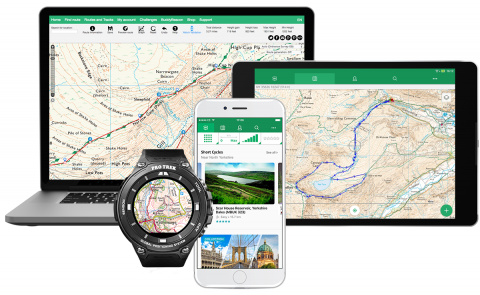 With millions of explorers around the world now using ViewRanger to plan, navigate, record and share their outdoor adventures, these are extremely exciting times. More than 6 million routes have now been recorded in our app, which is used and trusted by 300 Search and Rescue teams in 13 countries – a glowing testimony to the dedication, innovation and motivation of our amazing team.